A note to readers: the following is a posting I made on facebook a few days ago. It resonated with so many, and generated such intense conversation, that I wanted to bring it into an article here on the blog to share it with you. Included are my opening comments and many screen grabs of the conversation as it took place on my facebook page. Although part of my practice is to learn to navigate aversions so that they do not lead to disquieting states, I must admit that my discomfort with weight loss stories is challenging my practice. These stories come into view daily, sometimes multiple times a day. 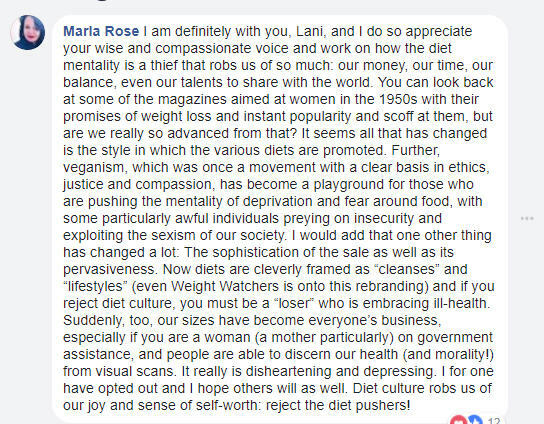 It’s not that I think that weight loss per se is a bad thing. Or that some people wouldn’t benefit from it, or want it. 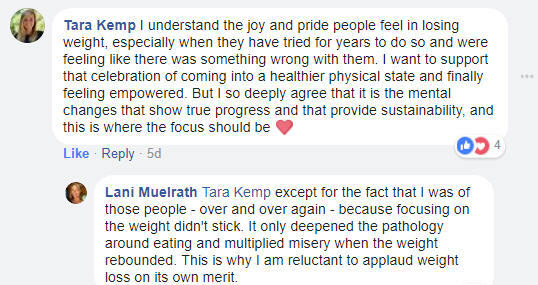 When I see a weight loss success story these days, besides cautionary aversion, it generates very little interest because I have seen enough people get burned with the promises they are given, or envision, that are not aligned with actually a healthier, happier life. Let us develop instead healthy living and happiness, and welcome our naturally healthy weight, so that when the weight normalizes, we have not learned that the only avenue to wellbeing is obsession which burns and fizzles faster than a firecracker. Let us concern ourselves with living with kindness and compassion for ourselves as well as others, to build a better world, ourselves along with it. The snow globe in action above (The Mindful Vegan: A 30-Day Plan for Finding Health, Balance, Peace, and Happiness on display at Spirit Rock Meditation Center book store, right next to works of the Dalai Lama) beautifully illustrates what happens with mindfulness meditation practice, and the practice of aspiring to bring some degree of that mindfulness into the rest of our day. We all have endogenous – innate to our brains and being – the qualities of compassion, kindness, patience, equanimity, happiness, joy…..it’s just that they have been obscured by our busy minds and our busy lives. Mindfulness practice helps to unobscure these these qualities so that we can live with less reactivity, greater ease, and make more skillful choices. This is the avenue that rescued me from thirty years of being a war with food, eating, and my body, twenty-five years ago when I took up a mindfulness practice and gave up dieting as I knew it in favor of living and eating mindfully. It’s all there in the book. What follows is screen shots of reader responses to my post as shared on facebook. So rich with meaning and connection, I knew I must share some of them with you. There are too many to share in this space, but you can still see all responses by clicking on the link to the original post at the end of this article. Are you done with restrictive eating that requires you to bring all your attention to an end result of weight loss? Do you have the sense that there must be another way? 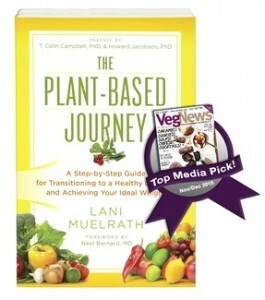 A way that reaches beyond the diets and restriction, instead embracing the all of you in harmony and happiness? In a fashion that also brings you into balance with your higher ideals of human living? Join the conversation by sharing your thoughts in comments below. Wow. Reading this brings to me such a sense of relief and hope. Intuitively I know this, I connect with this. I simply need some courageous leadership to help me move forward into new territory. 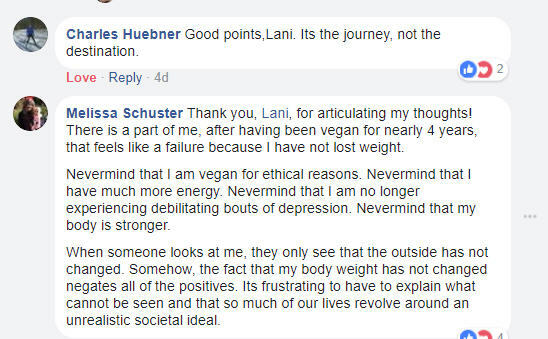 Thank you, Lani, for providing it. Sheryl, it’s true, isn’t it? Relief and hope are the natural response when we make the decision to put down the implements of war. Here! 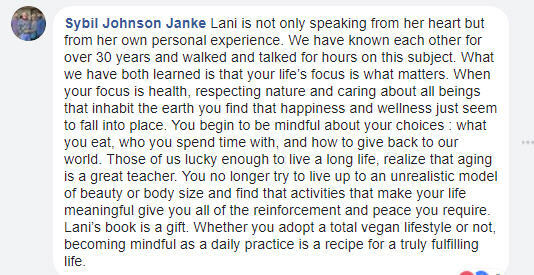 Thank you Lani for being such a voice of compassion and empathy. You have a way of posting exactly what I need to hear, exactly when I need to hear it. I always feel as though you truly care, and want to help those who need it. 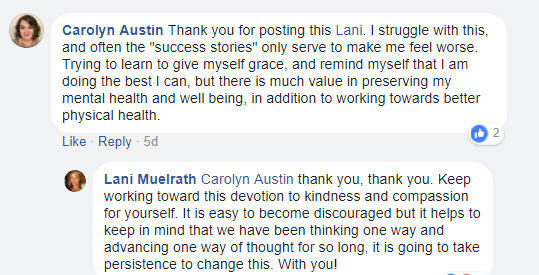 Carolyn, your thoughts and words mean so much to me. The mission of The Mindful Vegan has carried the theme of generosity from the start, and I plan to keep it alive. Thanks for being a fellow sojourner. Beautifully articulated! 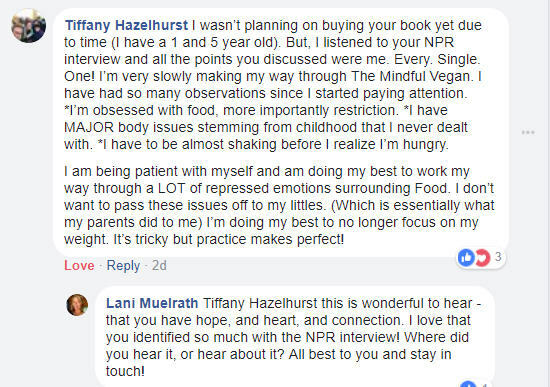 Developing mindfulness , slowly but surely, has been a key to opening the door to freedom from the self-imposed anxiety over every food decision. Letting go of attaining any idealized external state such as a number on a scale, and focusing on a much more life-enhancing internal state of peace and hopefully growing self-love is truly a huge “weight” off! I am very happy for you, to see these shifts that really do elevate our lives. It doesn’t mean that we can’t strive to select healthy foods, and to take care of our bodies – but once we understand that having more fit mind opens the door to fitness in all its other realms, well, you’ve got the gold ticket. Thanks so much for sharing your thoughts! I agree, Lani. 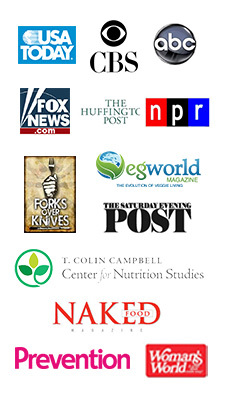 I do select the healthiest food that I am able to, but it is tremendously helpful,to take some of the pressure off, and , to relinquish some of my inner critic’s quest for an impossible dietary perfection. I have never been able to keep a meditation practice going (or a fitness program for that matter). I am hoping for more consistency in both. One day at a time. Elena, when we become aware – and really, it can feel like a tremendous moment of enlightenment, at least that’s how it felt to me – that it is our mental training that makes the difference for implementation and follow through on anything, and whole new world opens. You become free in a way like never before. We still respect and pay attention to the good tools of nutrition and healthy eating, and staying strong and fit so that you can live with vibrancy and energy – but with getting some degree of mastery over our habits of thinking, you realize why we have become frustrated with working on it all from the outside in. The obsession and uber-strict approach we now understand as our best effort to gain control – yet we also become encaged (is there such a word) and tense because we are trying to overcome a problem with inadequate tools. It’s like trying to change a tire with a screw driver. It doesn’t matter how hard we try, or how many times we try it, the tool just isn’t up for the task. We keep hoping – and keep blinding ourselves to what happened last time we tried to change the tire with a screwdriver. The fundamental reason we have trouble maintaining new practices is because we are hard-wired to our old ones. Mindfulness gets under the surface to a new technology, a technology of freedom. With this freedom comes the responsibility to do the practice. That is why I practice every morning, and most evenings. THe experience of freedom mindfulness has brought to my experience, and the reaches of it so far beyond simply eating and “weight loss”, are so profound that even when I am not in the mood – especially when I am not in the mood! I know it is a fundamental connection for a deeply improved experience of living.